Trond wrote in with some of the technical details, below the fold. 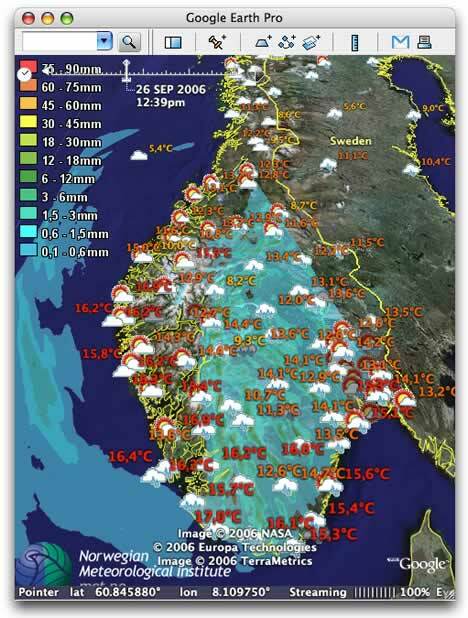 These are forecasts from the Norwegian Meteorological Institute, and they make use of GEs new time functionality. As you’ve noticed, GEs time support still leaves a lot to be desired, but I think it works fairly well in this example. I had to cheat a bit though, and say that the forecast for 6AM UTC is valid from 6AM to 12PM, and that the 12PM forecast is valid to 6PM, and so forth. It’s not accurate, but it “works”. Anyway – there are layers for weather symbols, precipitation measurements and four different weather models (temperature, precipitation, mean sea level pressure and wind). For the weather symbols, I’ve used different colors for the label, depending on the temperature. On precipitation measurements, I’ve done the same, but here I’m also changing the scale of the label depending on the amount of precipitation. If it’s 0.0mm, the label is removed. This is only a test for now, but if people like it (and I can’t really imagine why they wouldn’t :) we’ll probably make more weather models available in Google Earth.